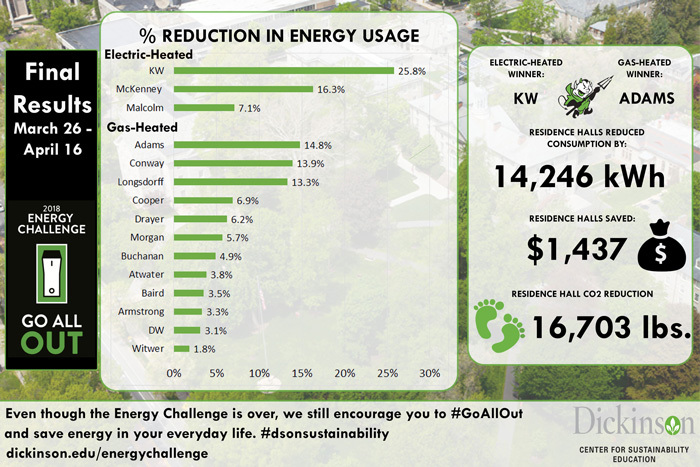 Dickinson’s annual Energy Challenge pits residence halls against one another to see which can conserve the most energy over a three-week period. And with Thursday night’s celebration bonfire on Morgan Field, the 2018 Energy Challenge came to an end. This year, Kisner-Woodward and Adams came out on top: Kisner-Woodward edged out Malcolm and McKenney for the electric-heated buildings, and Adams defeated Conway and Longsdorff for the gas-heated buildings. The winners received a championship banner for display in their buildings and a Leo’s ice cream party for all residents! But beyond lighthearted competition, the challenge hints at Dickinson’s Climate Action Plan and showcases some important themes. The results for the Residence Hall Competition can be found at the Dickinson Energy Dashboard. What they display is a small sampling of what people can do when they come together to make a difference.